Holly , the common name of several evergreen species of ilex, of the order aquifolia-ceoe. They have small axillary flowers, which when perfect are inclined to be solitary, but when sterile are in small clusters; these have a four-toothed calyx and as many petals, which are separate or only united at the base; stamens four; fruit a berry-like drupe containing four nutlets. The American holly, ilex opaca, is found along the Atlantic coast from Maine southward, it being especially abundant in Virginia and the states south of it; as seen at the north, it is a low tree, but in a favorable climate it attains a height of 30 or 40 ft.; the erect trunk is clothed with an ashy-gray bark, and the branches spread horizontally; the short-petioled leaves are oval in outline, with scattered spiny teeth, very thick and leathery, deep green above, and yellowish green beneath. This was formerly supposed to be identical with the European holly, but that has more glossy leaves with • much more conspicuous spines, brighter scarlet berries, and the nutlets more strongly veined. It is much more hardy than the European, which will not endure the climate of New York city with certainty, but it is not often seen in cultivation. There is no difficulty in removing small plants from their native localities, if the top be so far cut back as to remove all the foliage; new shoots will start in abundance if the tree be treated in this manner, but if removed with all its foliage success is very doubtful. 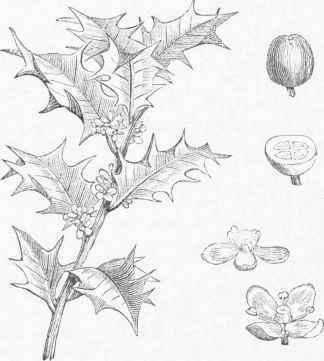 The uses of our species are the same as those of the European holly, I. aquifolium, which has long been a favorite in Great Britain as a hedge plant and for the ornamental character of single specimens. It is especially abundant in the south of Europe, but is not found in the northern portions, it not being hardy even in the north of Scotland. It is a very long-lived tree, some specimens having been estimated to be 800 and 1,200 years old. There are numerous varieties. Some of the green ones have the leaves entirely without spines, while others, such as the hedgehog holly, have them developed to a remarkable degree; there are several in which the foliage is beautifully margined or blotched with pure white or yellow, some of which are among the finest ornamental plants. There are also yellow- and white-fruited varieties. As specimen plants, the hollies are pruned in a pyramidal form, making a cone of dense green, with its base close to the ground, or they are made to assume the form of a tree with a clean trunk 3 ft. or more high. The variegated hollies are so fine that some American amateurs cultivate them in large pots or tubs, which are plunged in the ground during summer and removed to a cellar or other shelter for the winter. In Europe the holly is used for an ornamental hedge; it forms an impenetrable barrier, but is of too slow growth for a mere protecting hedge. There are in England many fine specimens of holly screens, 20 ft. high, and tilled with dense foliage from the very bottom. 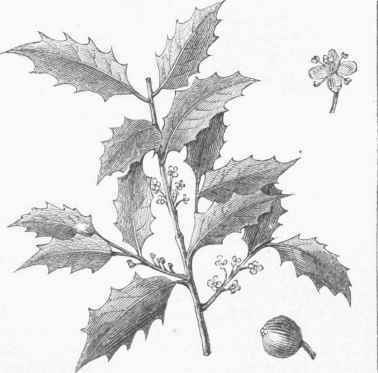 The dark persistent leaves, against which the bright scarlet berries show in tine contrast, make the holly a favorite plant for Christmas decorations; it is said to have been used for this purpose by the early Christians in Rome, and is in Europe still the plant chiefly employed in churches. Large quantities of the native holly are brought each year from Long Island and southern New Jersey to the New York market for the same use. The wood of the holly is remarkably white, except that at the centre of old trees, which is brown; it has a fine grain and a satiny lustre that well adapt it to ornamental work; it is used for small carved and turned articles, for whip and other handles, for inlaid work, and for various other purposes requiring a white, fine-grained wood. It receives dyes of various kinds readily, and much of what passes for ebony is the wood of the holly dyed black. Bird lime was formerly made from the mucilaginous matter furnished by the bark when boiled and fermented. The berries are purgative and emetic, and a decoction of the bark is sometimes used as a demulcent. The common holly is raised from seeds, which are kept in a rot heap mixed with earth for a year, and then sown; the finer varieties are propagated by budding or grafting them in the usual manner upon these seedlings. - The other native evergreen species of ilex are the I. Casaine (see Yaupon), I. Dahoon, and I. glabra (see Inkberry), which are shrubs with serrate or toothed, not spiny leaves. The Dahoon holly, not found north of Virginia, has leaves varying from oblong to linear-oblong, sharply serrate, downy beneath. A narrow-leaved form has been called J. myrtifolia.